New Zealand’s television broadcasters often reject advertising key numbers that do not comply with the industry standard. 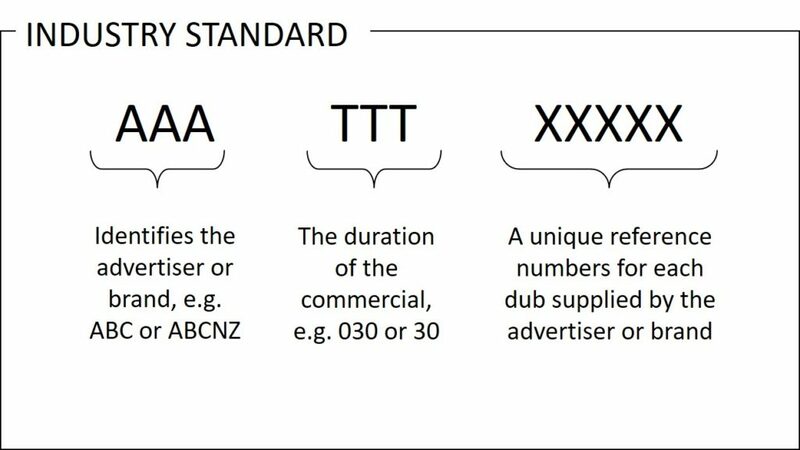 In 2009 the New Zealand television industry adopted an industry standard for the formatting of television commercial key numbers. This was in response to the growing problem of key numbers that were incompatible with the broadcasters’ playout and logging systems. All key numbers must follow the advertiser/duration/unique reference format (e.g. ABC 030 0001 and ABC 015 0002). This ensures that the advertiser and duration are easily identifiable and that no two dubs from a single advertiser will ever have the same last four digits. A key number should include no more than 12 alphanumeric characters. Dashes, slashes and hyphens are treated as spaces and are ignored. The ‘R’ suffix (e.g. ABC 030 0001R) should only be used to denote a technical amendment. Any change to the actual contents of the commercial requires a new key number.